Support Learners’ on the Learner Web. View their Goals and Profile. Grade quizzes and essays (Workspace items). 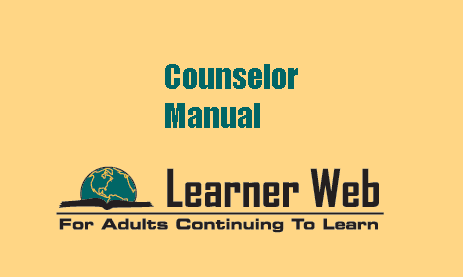 This section explains the basic navigation of the Learner Site. You will log into the Learner site to view the activity of your Tutees. You will need your Learner Web screen name and password. If you have forgotten your password, please contact your Counselor Administrator. You will also need to know the name of your Region. Follow the steps below to learn how to navigate the Learner Web Site. If you are logged-in skip to step 3. Add your Region’s name to the beginning of the address followed by a period (example: Oregon.learnerweb.org). Note: The URL is case sensitive. Enter your screen name and password. Result: The system takes you to the Counselor site. On the left side of the screen is the menu bar. Clicking on a plus sign expands a list in the menu. For example, it will reveal any Steps or Sub-steps of a Goal or Plan. Clicking on under a Learner’s name will display that Learner’s Profile. 4 If you have any other questions about general navigation through the Learner Site, you can ask your Counselor Administrator for more help. Follow the steps to view your Learner’s work. If you are logged-in skip to step 3. 3 From the drop down menu, select a Learner. Note:Some Learner’s may not allow you to view their Profile, Goals or Workspace items. In that case, no information will appear when you select their name. There you may be able to find out about their interests, location, aspirations etc. The information in the profile form will depend on the questions that your Region has decided to ask. If you would like to add questions to the profile, contact your Regional Administrator. Select a Plan or Goal that they are working on from the drop-down on the left side. Below, click on the plus sign in front of a Goal’s name (for example “Keep Coming Back”) to view the Goal’s Steps. Click on Step names to see information about that Step or continue clicking on plus signs to reveal subordinate items (for example, Sub-steps). Note: Remember that you will not be able to view any of this information without the Learner’s consent. Read the Step Overview on the right side. View and edit the Step’s status using the buttons. Click on the Workspace item’s title to view the questions. Click on the Resource name. Then, click on the URL or follow the directions to locate the Resource. Are you finished viewing Learners’ work? If yes, press in the upper right corner. If no, repeat steps 3-5 to view other Learner’s work and/or continue working on the Learner Web. .